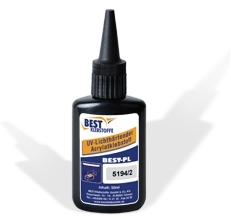 BEST-PL 5194/2 is a one-component, solvent-free, adhesive based on a modified acrylic resin. One of its special features is its very good adhesion even on critical surfaces, e. g. PC and polished aluminium. BEST-PL 5194/2 cures by exposure to light with a wave length of 400 – 500 nm. At least one of the adherends has to be permeable to light. After sufficient exposure the product cures completely. Curing parameter depend on material thickness and absorption, adhesive layer thickness and absorption, type of lamp and the distance between light source and the adhesive film. Due to its high viscosity and its good adhesion on glass, metals and synthetic materials BEST-PL 5194/2 is preferably used for bonding of those materials. Apply product on bonding surfaces, assemble parts and expose to UVA-light of appropriate wave length. The curing mechanism allows an adjustment of parts shortly after application but before exposure. The flexibility of the product makes tension-equalising bonding of materials with different thermal expansion coefficients possible. BEST-PL 5194/2 is ready to use and can be applied directly from the original container or with suitable dosing units. Bonding surfaces should be dry and free of dust, grease and other contaminants.